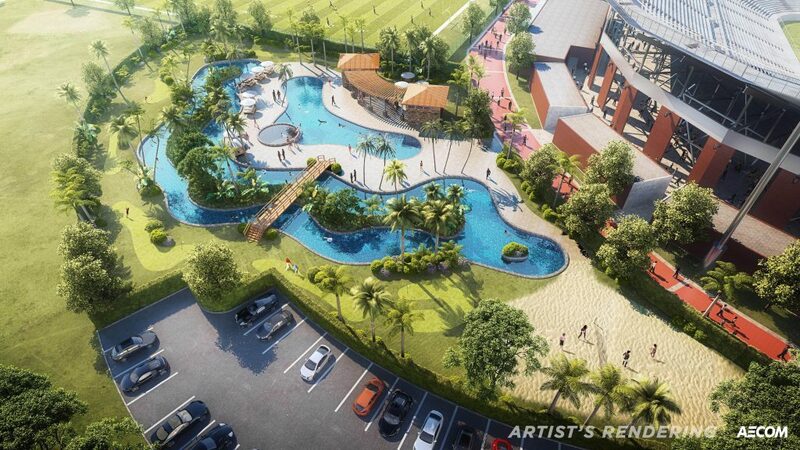 A resort-style lazy river will become just one part of the plan to transform the UCF main campus Athletics Village into the nation’s best out of all Division I universities. The $25 million initiative, driven entirely by donations, features a comprehensive overhaul on the athletic facilities the university brings into play. When Knight News spoke to Director of Athletics Danny White on Monday among local media, plans for the Recovery Cove included the possibility of the cove opening for use by students and fans on UCF Football game days at Bright House Networks Stadium. The UCF Athletics Recovery Cove will also focus on the health of student-athletes as will the Garvey Center for student-athlete nutrition. The Recovery Cove currently holds an intended spot adjacent to the UCF Football practice fields and Wayne Densch Center for Student-Athlete Leadership. This area features the lazy river surrounded by palm trees, a separate pool, a mini-golf course, a cabana area, beach volleyball sand court, and more, according to the most recent visual concepts. White said that other possibilities include the Recovery Cove being rented out privately along with new facilities planned in the $25 million We Rise and Conquer initiative. Over the past few months, according to White, the initiative’s foundations have solidified with the current direction for the multi-million dollar plan. Several items, such as the name for the UCF Basketball Excellence Center, may change as time moves on. Facilities such as the John Euliano Baseball Park will break ground and begin construction as early as this Spring following the conclusion of the baseball season. University of Central Florida Director of Athletics Danny White met with media Monday afternoon to outline the vision for the future of Knights Athletics. Alumnus Ken Dixon, 1975, boosted the development of a $25 million initiative started by White and other school officials with the largest donation ever gifted to UCF – $5 million. Over a few months, plans for a nationally competitive – aimed at best in the nation out of all the Division I universities – began to solidify. 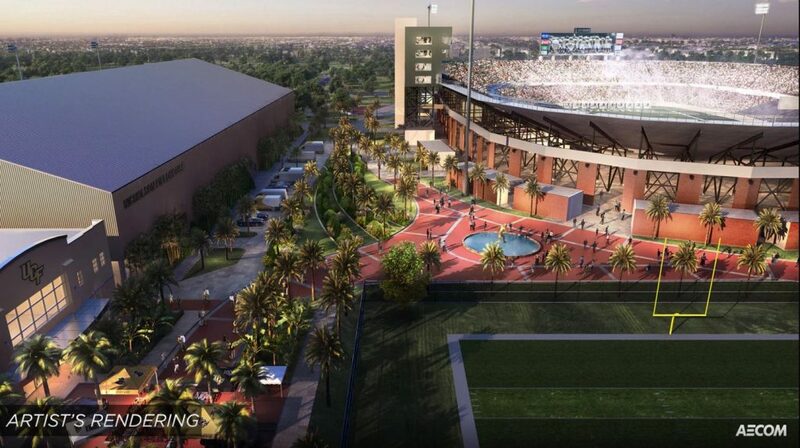 These plans were announced to the UCF community Monday morning with promises to change the face of the university’s athletics across every sport. Student-athletes of these sports will benefit from brand new facilities dedicated to health and wellness. Sports that utilize on-campus playing fields will benefit from new scoreboards, rehabilitation facilities, and other amenities outlined by the White. In a press conference interview, White noted that the resources needed to complete the beginning phases of the project have been met. Ground will be broken on the John Euliano Park expansion and renovation immediately following the conclusion of the 2017 baseball season, with completion set at before the 2018 season begins. “The facilities vision is something we’ve worked on for the last several months. We’re excited with how it positions us regionally and nationally in college athletics,” White said on Monday. With the dedicated donations brought in will come, firstly, the Garvey Nutrition Center on the South side of the stadium – an effective and quick first step in transforming the health-centered aspect of the We Rise and Conquer Campaign. The UCF Student-Athlete Recovery Cove will hold a spot adjacent to the football practice fields and the Wayne Densch Center for Student-Athlete Leadership. This recovery pool/resort style area will directly benefit student-athletes and has the potential to benefit fans on game days at Bright House Networks Stadium, according to White.